We had just completed the graduation in the last post; Usually, by this point, I am beginning to see the interior of the f-holes, too, because, as you may recall, I had incised them pretty deeply. In this particular case, I could just barely see some portions. I guess they were not as deep as I thought they were. 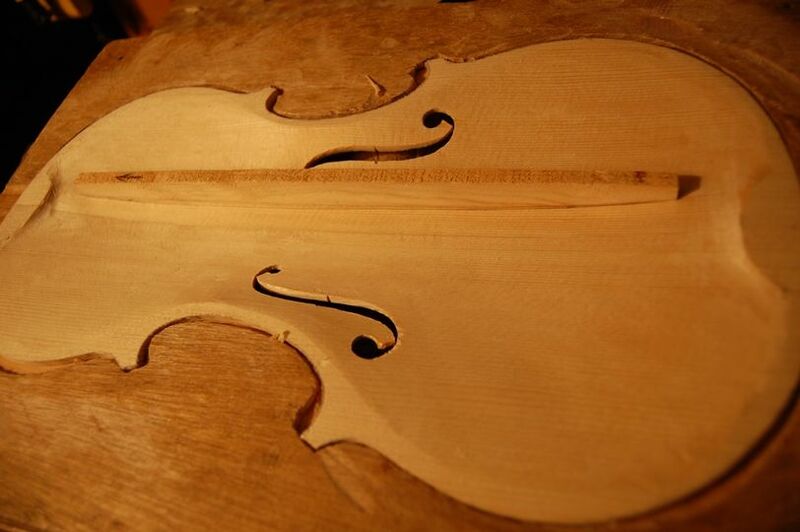 F-hole drill being used to cut the lower eyes on a cello. F-hole drill with completed eyes and cut-out plugs. 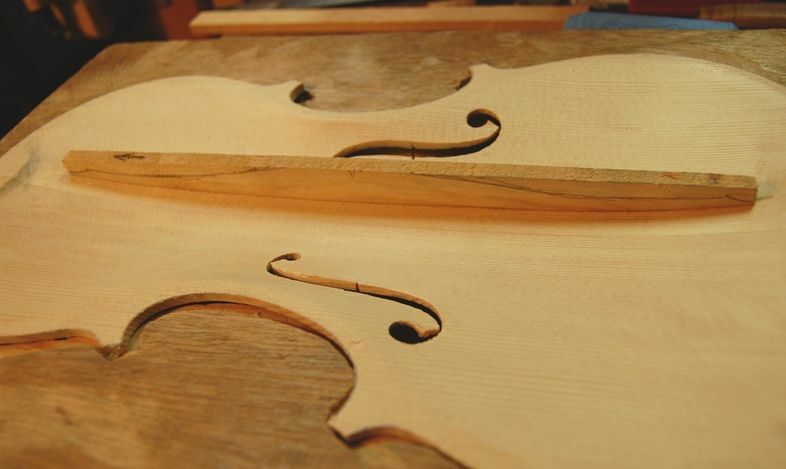 Just getting the f-holes cut is only part of the job…they need to be clean, and smooth, and relatively symmetrical. I will keep touching them up and tweaking them until the day I begin the varnish, most likely, but here they are; close to being complete, if not completely done. 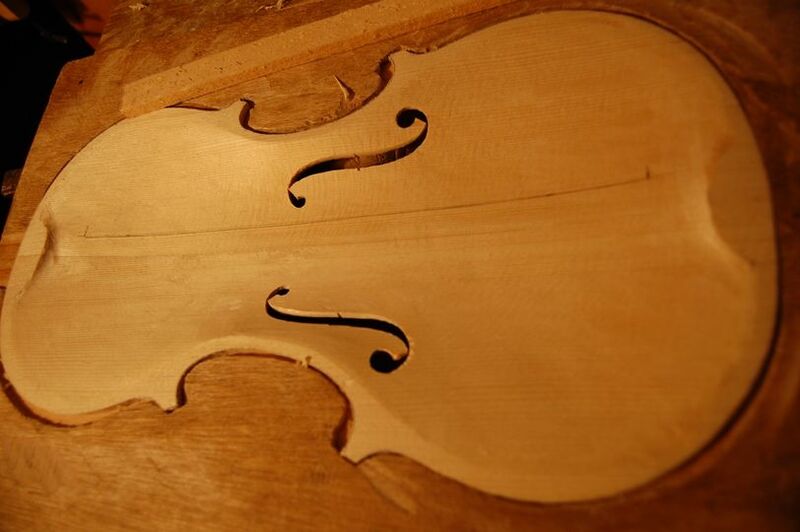 By the way, you may have noticed that on this instrument (and the last one) I purfled after installing the plates. I was taught to purfle early, but I always had trouble getting my overhang even, and my purfling parallel to the ribs. So I tried purfling after closing…works fine and looks better. Diff’rent strokes, I guess…. When the f-holes are complete, and clean, I can fit the bass-bar. 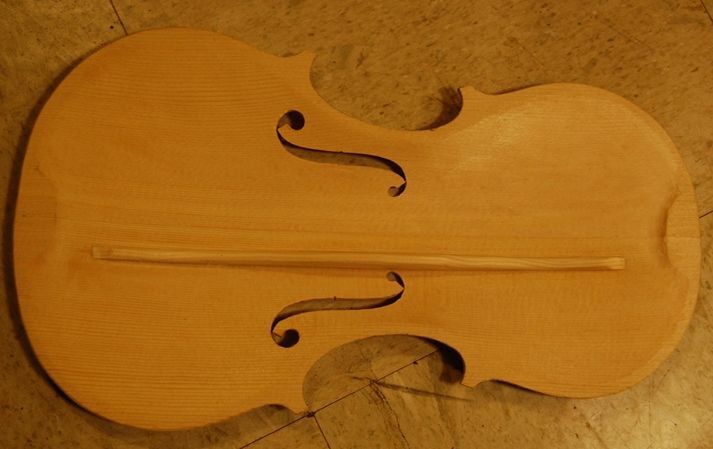 The bass-bar is a spruce brace supporting the bass-side of the bridge, and providing for a good sound on the low strings. 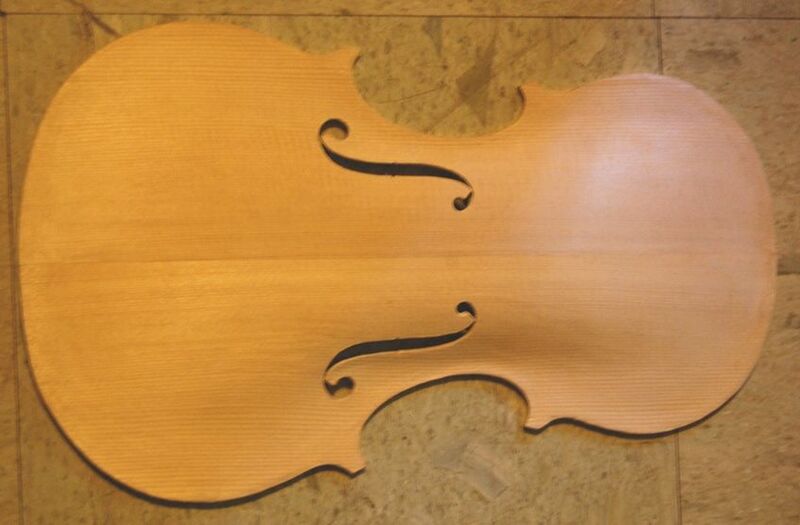 Then I do something a little unusual: lots of luthiers chalk-fit bass-bars…in fact, probably most of them do. I have only known one or two who can successfully “eye-ball” the thing in. But I do not like the looks of chalk-residue mixed with hide-glue, either. I can’t see the white chalk clearly enough to use it, and the others leave an ugly residue– expecially the green or blue chalks. So… what to do? Someone, years ago (can’t recall who…probably my friend Jake Jelley), pointed out that the paper gauze tape sold in pharmacies will stick securely, you can see the line through the tape, and it holds the chalk very well. The tape (3M Micropore) is so thin and fragile that you get a very good fit, but when you take the tape off after the fit is perfect, all the chalk comes off with it. (Careful! It can pull splinters off, too!) Hey, Presto! 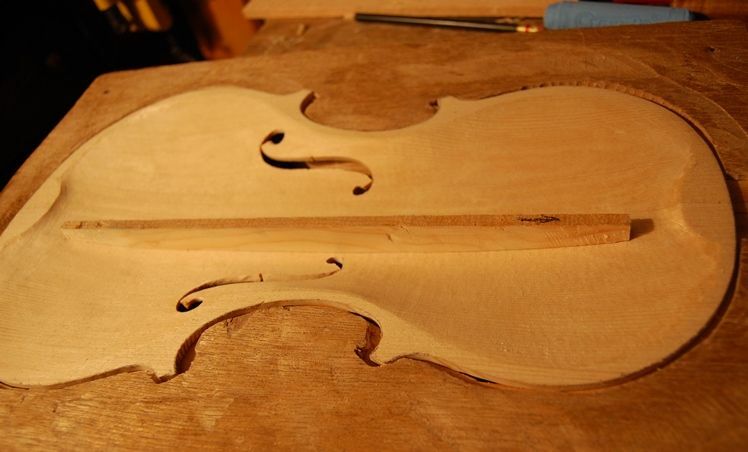 Clean wood, and you are ready to glue in the bass bar! 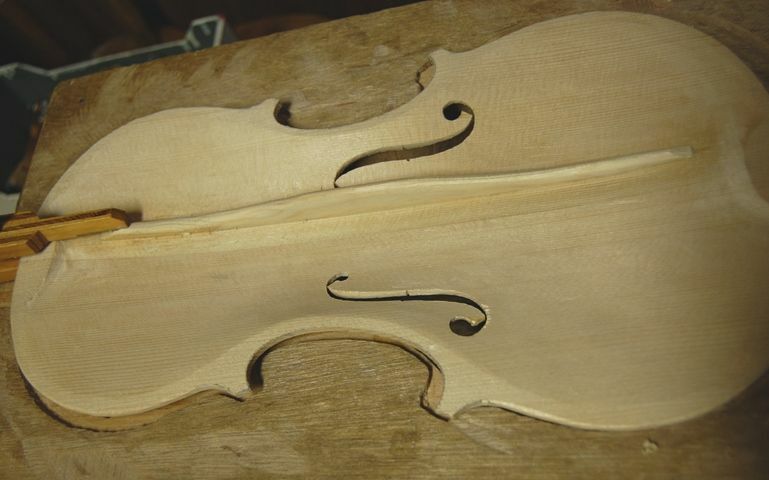 I pre-fit the bass-bar by eye, using a compass to mark the contour from both sides, then trimming with knife and plane until the fit is close. 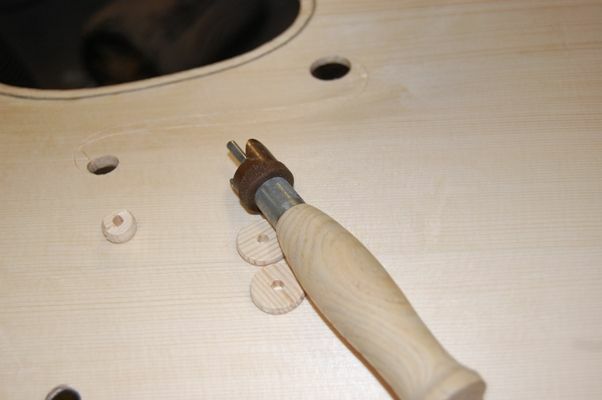 Bass-bar pre-fit by eye, using a knife and plane to trim the wood to a close fit. Chalk-fitting is next. Then I apply the paper tape, darken the line on the tape as needed, and begin the chalk-fit process. 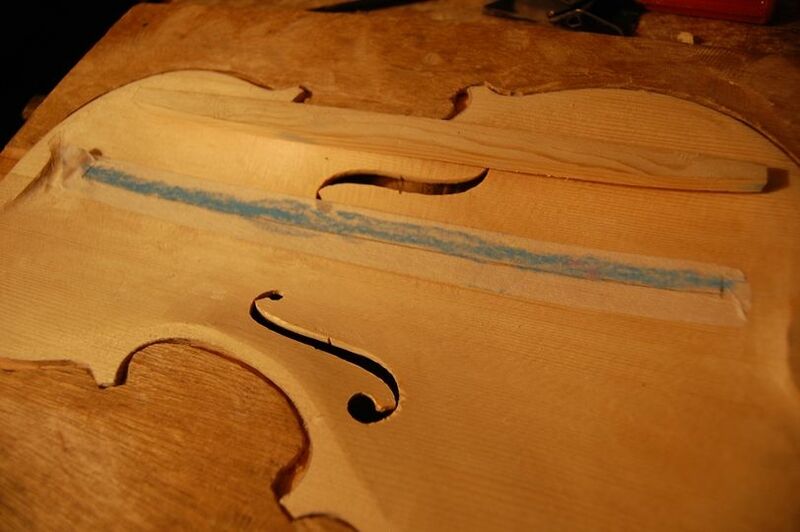 It is important to learn to JUST plane or scrape away the portion of the bass bar with chalk on it, on each try. Don’t plane off whole sections…it is possible that only that one little place with the chalk was high. There is the paper tape…you can still see my layout lines. Chalk-fit complete, and tape removed. Notice the arrow on the upper end of the bar: that is to keep me from forgetting which end is which. I check the fit by clamping the bar in place, dry. 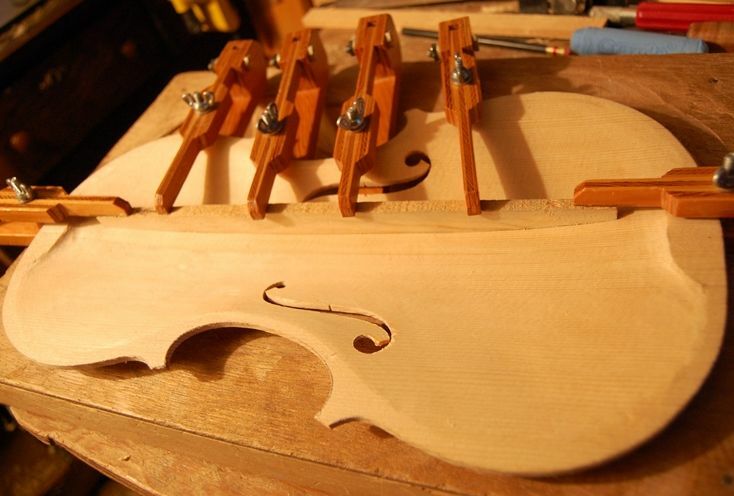 Then I remove the clamps, and slather on the hot hide glue–carefully. I quickly re-position the bar and clamp it securely, then clean up, using hot water and a brush. The small amount of watered-down glue soaking into the wood around the bar doesn’t seem to hurt anything, so I don’t worry about it. 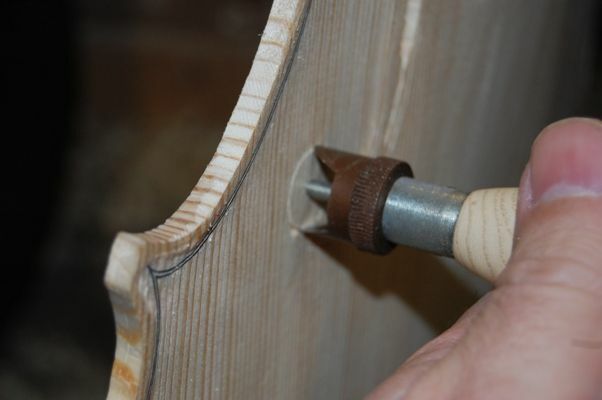 Bass-bar glued, clamped and brushed down with hot water. 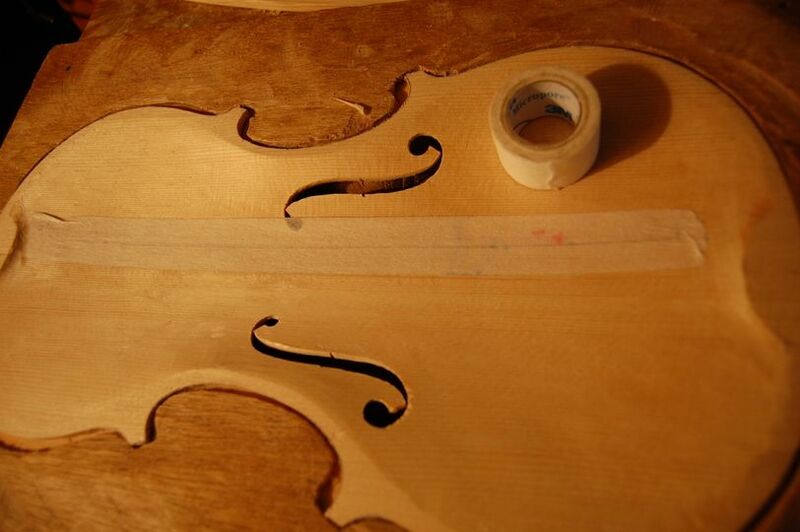 When the glue is completely dry, I remove the clamps and shape the bar…”just so”. 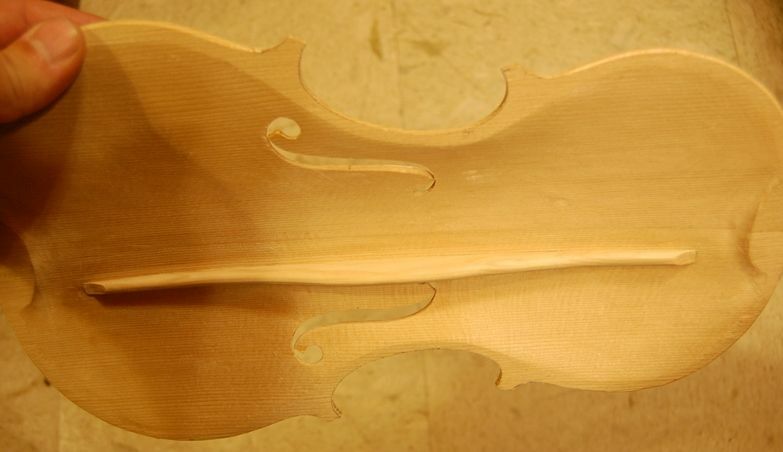 The glue is dry… see the sketched-in proposed shape of the finished bass-bar. The dark area beside the bar is just a shadow, not glue. I do not have a “scheme”, here, and I do not measure it beyond occasionally checking the center height. I am just going by feel, by eye, and by experience. I know if the bass bar is too weak, it will affect the sound of the bass string…so I err on the side of a tall bar. I am certain that many will frown upon this. I am not telling you how you should cut a bass-bar; just sharing how I handle mine. And…there’s the plate, completed and ready to install! Well…sort of…. The glue was a little too thin on one end of the bar and it popped off for about a 2″ section. So it has been re-glued and is drying. Bass-bar nearly complete. One end popped loose, and needed re-gluing.I will do a little final shaping before calling it done. Besides, the inner edges of the plate will have to be rounded and smoothed before I can actually install it. But there are probably less than 30 minutes of work left before I can glue the front plate in place. So it’s almost done. I hope to install it tomorrow, but I have some other things to do, as well. 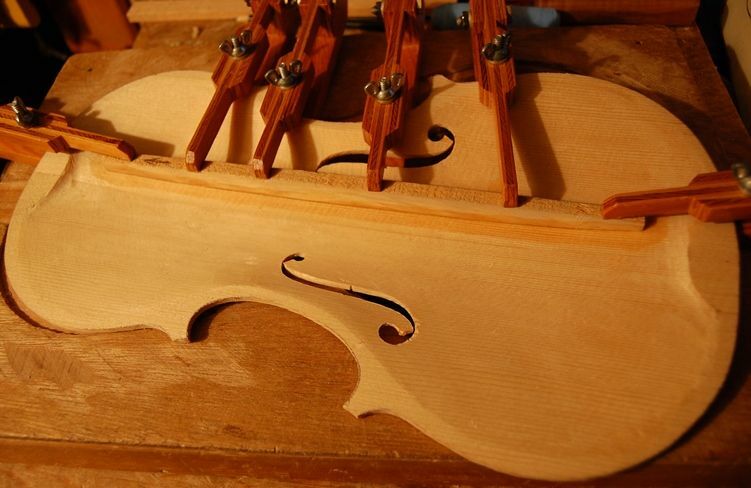 So, the next post will involve completeing the neck and fingerboard assembly, installing the front plate, and setting the neck. Could be a week away; I am going to be working a lot of overtime on my day-job, for the next several months it seems. Side view…lighting is difficult, but you can see the profile.